This time it was not a certain song possessing poetic words that tugged at my soul whisking me back to times once known. It was not a particular sentimental fragrance that pulled me into my yesterdays. 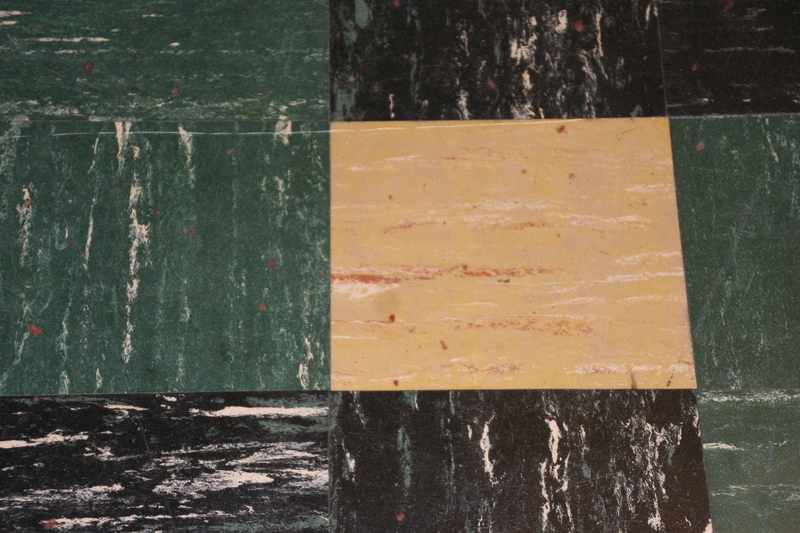 It was but a simple floor tile of yellow, green and black. That fifties tile recently uncovered during a renovation after many years of being hushed and hidden beneath our feet. A flood of memories to be true, that rushed through my head and heart as I stood in wonder. Memories of paper dolls, coloring books, and my beloved chalkboard where I taught school to the empty chairs lined up proper before me. A rare cherry cigar or pipe smoked by my father as we watched Wild Kingdom and Walt Disney with popcorn and Pepsi Cola. Adventurous winter days of cooking hot dogs in the fireplace or just watching the fire snap and crackle while wrapped up in a favorite blanket. Days with cousins, aunts and uncles as we filled the house with constant chatter and much laughter. Projector screen and slides shown at days end with the curtains drawn, ooing and ahhhing to life as remembered with simple reverence to days gone by. Music being played on the record player- careful not to jump and skip the vinyl while dancing to the Twist and Cha Cha Cha. Oh the days brought back by the simple floor tile…Christmas trees, Thanksgiving tables and hidden Easter eggs. Grandchildren and their first steps as well as family together grieving the loss of my mother….all memories held in the space of this room supported by the tile floor underneath So strong, so sturdy, yet silent. Only asking for a buffing and wax in the early days. But as style dictated, covered with various carpets throughout the years. The old carpets are gone…torn out and rolled up and thrown away. But the tile…ever faithful to this day. Alas, we both know that soon once again to be covered and tucked away for discovery sometime in the future. I only wonder if it will be me peering upon the yellow, green and black or someone new …someone who has no idea the richness of the memories quietly possessed within. Previous PostPrevious The Road Less Traveled….